Malocclusion problems are issues related to the position of the teeth when the jaw is closed. If the teeth and bite are misaligned, it can contribute to the appearance of crooked, uneven teeth. Malocclusion problems can also impact oral functions, make it more difficult to clean the teeth and gums, and compromise a person’s oral health. Although orthodontic services can correct most malocclusion problems, many patients are hesitant to seek treatment because they don’t want to wear bulky, uncomfortable braces. Invisalign® clear aligners offer an alternative to traditional braces. These aligners are more comfortable than traditional braces, and much more discreet. Yet they are just as effective in treating most malocclusion problems, including an underbite or underjet. Patients who would like to learn if they are candidates for Invisalign® for underbite or underjet can meet with Skillman, NJ general dentist James Altomare to learn more about this revolutionary treatment. How Does an Underbite or Underjet Affect the Bite? When the teeth and jaw are aligned properly, the upper arch of teeth will run parallel to the lower teeth. The upper arch will be slightly wider than the lower arch, and the upper teeth will overhang the lower teeth when the bite is closed. This degree of overhang should not be severe. Ideally, about one-half to two-thirds of the length of the bottom teeth will still be visible when the bite is in the closed position. When a patient has an underbite or underjet, the lower front teeth overlap the upper front teeth and cover them up when the jaws are closed. This looks unnatural and deters from the beauty of the smile. Further, an underbite or underjet makes it more difficult to bite, chew, and speak; it can also place too much stress on the lower teeth, which is likely to lead to dental damage. In all but the most severe cases, Invisalign® treatment should be able to effectively correct an underbite or underjet. Invisalign® places subtle but persistent pressure on the teeth and jaw to encourage their gradual movement. Each Invisalign® treatment plan is specifically tailored to the unique needs of each patient. 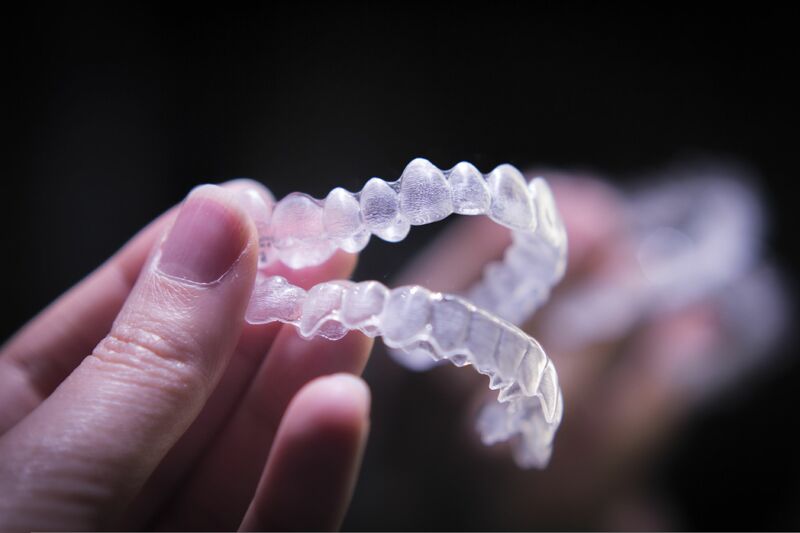 All Invisalign® aligners are customized for each patient so pressure is applied where needed to properly align the teeth. Every two weeks, patients will progress to a new set of aligners. This ensures that the teeth and jaw are continually encouraged to align. In about the same amount of time as traditional braces treatment, Invisalign® can correct a minor to moderate underbite or underjet. The aligner trays used to provide pressure are completely free of metal brackets and wires. In fact, they are made out of a soft, clear plastic that fits securely over the teeth without irritating the gums or other soft tissues of the mouth. Another unique feature is that the Invisalign® aligners are completely removable. Patients can take their aligner trays out to eat, brush, or floss their teeth. This added convenience makes it easy to care for the teeth and keep the smile healthy while undergoing Invisalign® treatment. All of the benefits that Invisalign® provides makes this the preferred teeth straightening treatment for many of our patients. If you have a misaligned bite or crooked teeth and would like to find out more about Invisalign® treatment, schedule an appointment at your earliest convenience. Dr. James Altomare can answer any questions you may have about the Invisalign® process.